A new analysis from SHADAC examines educational attainment and access to health care, looking at the extent to which adults (25 years and older) with different levels of education skipped needed care due to cost and did not have a personal doctor. These indicators are both available for all states in SHADAC’s State Health Compare. The analysis, which uses data from the Behavioral Risk Factor Surveillance System (BRFSS), found that people with less education are much more likely to skip needed medical care for financial reasons: Nationally, adults with less than a high school education were more than three times as likely to skip care due to cost in 2016 than were adults with a bachelor’s degree or higher (22.9% vs. 7.3%). Among the states, all but one (Alaska) saw significantly higher rates of foregone care among adults with less than a high school diploma than among college graduates. 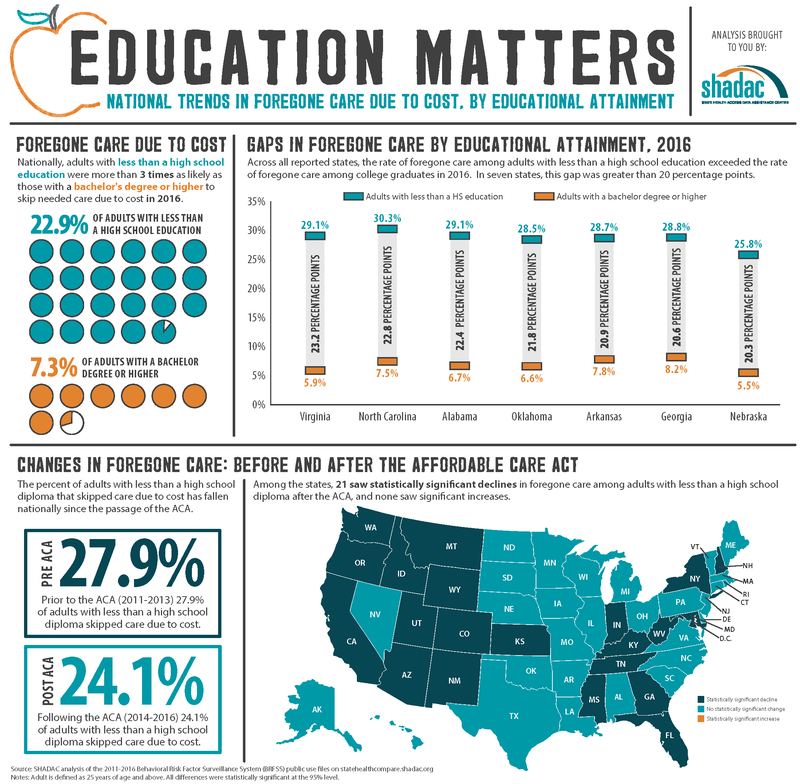 In seven states, the rate of foregone care among adults with less than a high school education exceeded the rate of foregone care among college graduates by more than 20 percentage points: Virginia, North Carolina, Alabama, Oklahoma, Arkansas, Georgia, and Nebraska. The percentage of these adults with less than a high school diploma that skipped care due to cost has fallen nationally since the passage of the ACA, from 27.9% in the years preceding the ACA (2011 to 2013) to 24.1% in the years following the ACA (2014 to 2016). Among the states, 21 saw statistically significant declines in skipped care after the ACA, and none saw a significant increase. Nationwide, adults with less education were twice as likely to report that they did not have a personal doctor in 2016 as compared to people with a college degree or higher, at 31.8% vs. 15.2%. This same pattern was seen in 44 states. Among the remaining six states and the District of Columbia, no statistically significant differences were found between the two educational groups on reports of lacking a personal doctor. In ten states, the rate of not having a personal doctor among adults with less than a high school diploma exceeded the rate of not having a personal doctor among college graduates by more than 20 percentage points: Colorado, Wyoming, Kansas, Texas, Nevada, Utah, Georgia, Florida, Washington, and California. 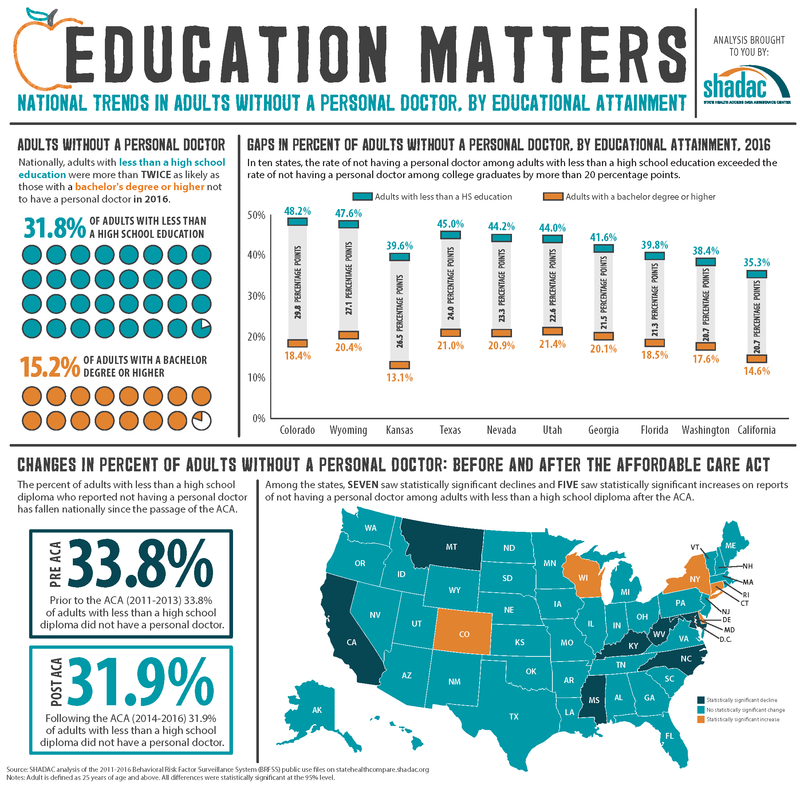 As with foregone care, the percentage of adults with less than a high school diploma who reported not having a personal doctor has fallen nationally since the enactment of the ACA, dropping from 33.8% to 31.9%. Significant declines on this measure were also seen in 7 states after the ACA went into effect, and 5 states saw significant increases. Nationwide, 14.1% of adults had less than a high school diploma in 2016, and 16 states were above the national average on this measure. Texas, at 19.5%, had the highest percentage of adults with less than a high school diploma, followed by California (19.0%), Mississippi (18.0%), Louisiana (17.3%), and Kentucky (17.0%). North Dakota, New Hampshire, Wyoming, Montana, and Minnesota had the lowest percentages of residents with less than a high school education in 2016 (at 7.3%, 7.5%, 7.7%, 7.8%, and 7.9%, respectively). SHADAC researchers have created fact sheets for all states and the U.S. on the above measures. These fact sheets, along with infographics for select states, are available at www.shadac.org/Education&Access. Learn more about the indicators used in this analysis, as well as other measures related to social determinants of health, at statehealthcompare.shadac.org. The 2016 estimate for this measure was suppressed for Alaska because the standard error is greater than 30% of the size of the estimate.